Today I am gonna show you a little progress for a new wig I have started to style. 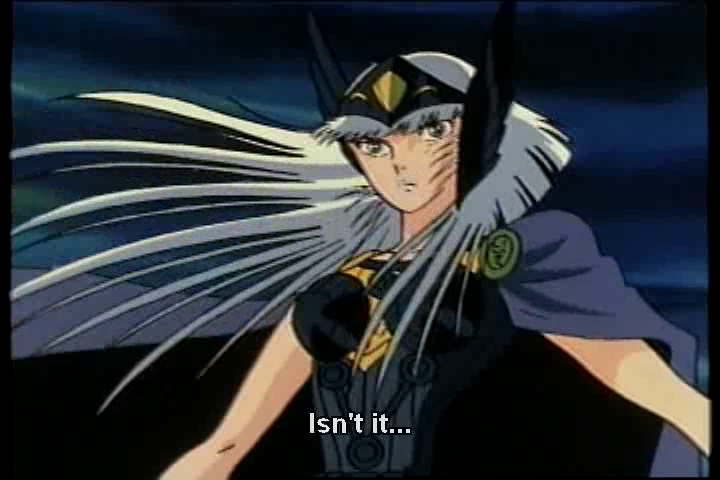 As you can see it is gonna be Hilda from Saint seiya this time. It has a few difficulties in it thats the reason why I think it may be interesting to see what I have done to make this wig ready to use. It was this wig I have styled. 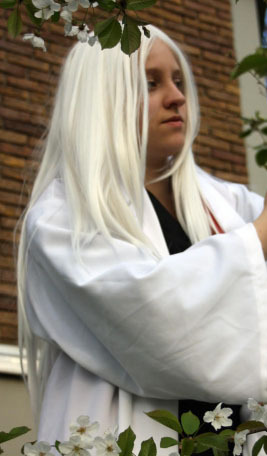 It was my Ukitake wig from Bleach und has done a good job for years. 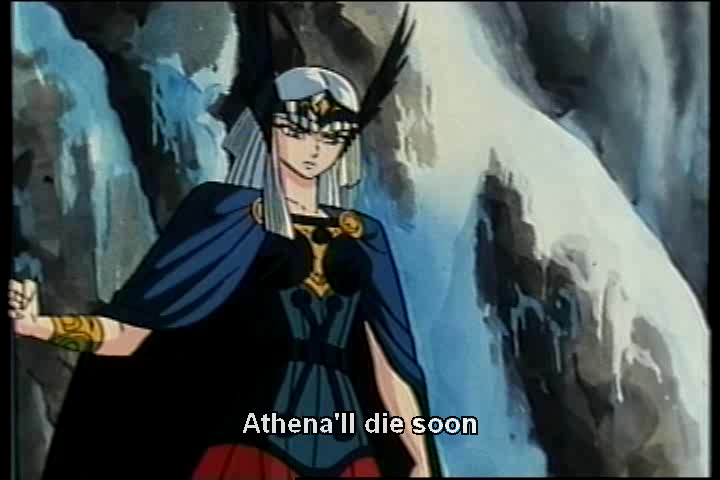 But as you see is it thinner than good for Hilda. It has gotten thinner than usable, and the laces were seen during wearing. If I had not done anything I had to throw it into the bin. The Best thing you can do in this case is finng your wig up with parts from another wig. 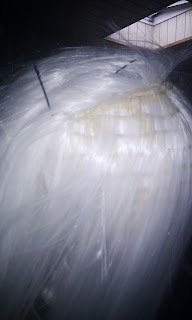 I have cutted the laces from the other wig and have started working. Here are the cuted laces. I am so glad and lucky that I had gotten cheap peaces at "Bring and Buy" on Convention in the same hair color. They are shorter than the main wig but in my case it was better to use a short wig because I have to cut all parts short later. If a long wig needs to get spikey all hair should have the same length. Here is the first step to "refuel" the wig. Put the hairs up an search for the highest lace. 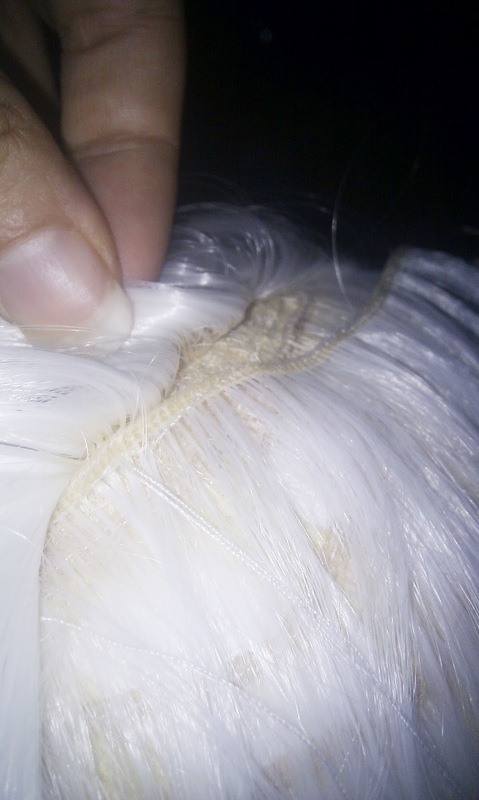 On this photograph you can see how thin this wig was already grown. 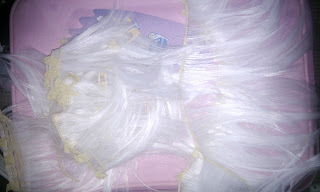 Well I have looked for the highest lace and fixtated it a few hair needels. I have glued the laces with glue from a hot glue gun a few rows. 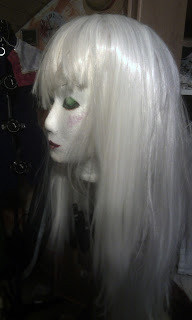 The same I have done with almost every other part from the other wig. Do not forget to brosh it afertwards because there may be glueparts left in the hairtips. And be carefull because I have almost burned myself with the hot glue. 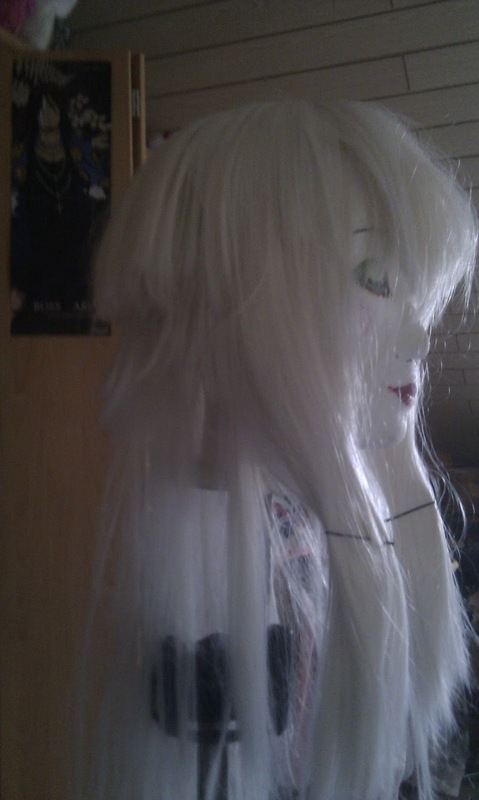 The only thing left I have to do now is cutting and fill the pars underneath up with cutted hair. This will be shown later but as you can see is Hilda already that far that I can use the wig soon. I have now three weeks left to do the whole Costume. Other progress photographs will follow and I hope to see you soon. New name and new CosCards!